The Wheeler—Stokely Mansion was constructed during what is known as the Country House Era, a time when the wealthy built homes for their families outside the city. This trend is reflected in the string of mansions the wealthy built in the early 1900s along Cold Spring Road, which was known as “Millionaires Row.” The estate harks back to the early years of suburbanization in Indianapolis. Its first owner, Frank Wheeler, was closely associated with Indy’s significant automobile manufacturing industry. The house, designed by a master architect, is among the city’s best examples of Arts & Crafts architecture. 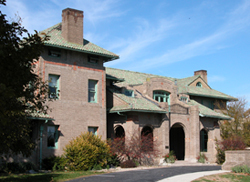 “Hawkeye” was the name Frank Wheeler gave his new mansion and estate overlooking Cold Spring Road, which was completed in 1911. Wheeler, a native of Iowa, earned his fortune in auto parts manufacturing in Indianapolis. He co-owned the Wheeler—Schebler Carburetor Company. The company made carburetors for more than 15 auto manufacturers including Ford, Dodge, Auburn, and Duesenberg. He was also a co-founder of the Indianapolis Motor Speedway. Later owners of the estate included G. Monty Williams, president of the Marmon Motor Company, and William Stokely, owner of Stokely-Van Camp Packing Company. The Wheelers hired William Price of Price & McLanahan, a Philadelphia firm, to design the mansion. The house is 2½–stories with walls of tan face brick, capped by a green terra cotta tile roof. The bands of geometrical glazed tiles at corners and along upper walls were a trademark of Price & McLanahan’s Arts & Crafts style. They are Mercer tile made by the famous Moravian Pottery and Tile Works of Pennsylvania. A porte-cochere accommodated the Wheelers’ automobiles. The grounds, believed to have been designed by local landscape architect A.W. Brayton, included a large reflecting pool with tower. 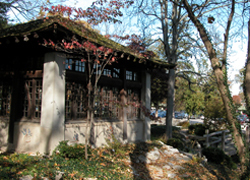 While the pool and tower are gone, a long pergola and Japanese gardens with tea house and gardener’s cottage remain. The Wheeler—Stokely Mansion is located on the northwest side, at 3200 Cold Spring Rd. The estate is now part of Marian College. Only the grounds are open and are accessible dawn to dusk. Be sure to visit the Allison Mansion and grounds close by at the same time. INDYGO bus line from downtown: #15 Riverside, disembark at 30th and Cold Spring Rd.